St. John Baptist de La Salle as a canon. Founder of the Institute of the Brothers of the Christian Schools, educational reformer, and father of modern pedagogy, was born at Reims, 30 April, 1651, and died at Saint-Yon, Rouen, on Good Friday, 7 April, 1719. The family of de la Salle traces its origin to Johan Salla, who, in the early part of the ninth century, was Commander-in-chief of the Royal forces of Alfonso the Chaste. It was not, however, until about 1350 that the younger branch of this family, from which our saint is descended, removed to France and settled in Champagne. John Baptist was the eldest child of Louis de la Salle and Nicolle de Moet de Brouillet. His parents were very solicitous in the care they bestowed upon their child, especially in regard to his moral and intellectual development. After due preparation, he was sent to the College des Bons Enfants, where he pursued the higher studies and, on 10 July, 1669, he took the degree of Master of Arts. Canon Pierre Dozet, chancellor of the University of Reims, was the presiding officer at the academic sessions, and in the discharge of his function had opportunity to study the character of his young cousin, de la Salle, with the result that he determined on resigning his canonry in his favour. 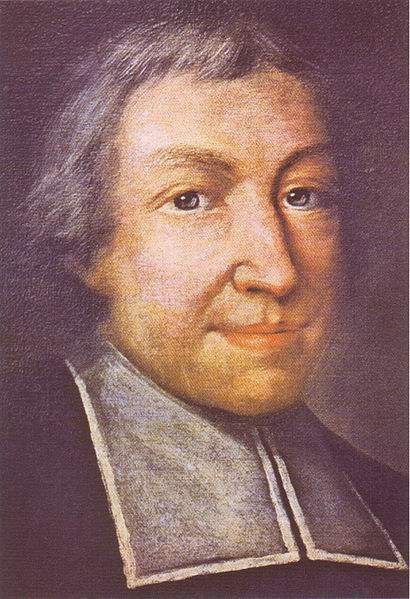 Louis de la Salle, however, cherished the hope that John Baptist would select the profession of law, and thereby maintain the family tradition. 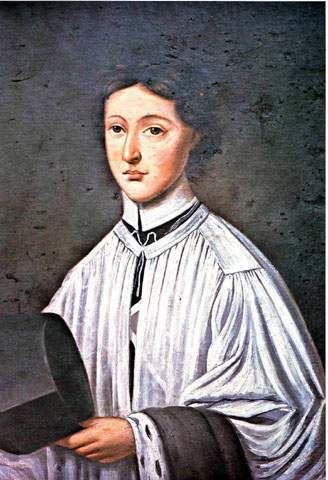 But young de la Salle insisted that he was called to serve the Church, and accordingly he received the tonsure 11 March, 1662, and was solemnly installed as a canon of the metropolitan See of Reims, 7 January, 1667. When de la Salle had completed his classical, literary, and philosophical courses and had read the Schoolmen, he was sent to Paris to enter the Seminary of Saint-Sulpice on 18 October, 1670. While residing here he attended the lectures in theology at the Sorbonne. There, under the direction of Louis Tronson, he made such rapid progress in virtue, that M. Lechassier, superior general of the Congregation of Saint-Sulpice, renders this testimony of him: “De la Salle was a constant observer of the rule. His conversation was always pleasing and above reproach. He seems never to have given offence to any one, nor to have incurred any one’s censure.” While at the seminary de la Salle distinguished himself by his piety as well as by the vigour of his intellectual progress and the ability with which he handled theological subjects. Nine months after his arrival in Paris, his mother died, 19 July, 1671, and on 9 April, 1672, his father died. This circumstance obliged him to leave Saint-Sulpice, 19 April, 1672. He was now twenty-one, the head of the family, and as such had the responsibility of educating his brothers and sisters. His whole attention was devoted to his domestic affairs, and he provided for every circumstance by his discreet, businesslike administration. Canon Blain says that he underwent at this time many mental struggles. Distrusting his own lights, de la Salle had recourse to prayer and the guidance of discreet advisers, among them, Nicolas Roland, canon and theologian of Reims, a man of great spiritual discernment. Acting upon the advice of the latter, the future founder was ordained subdeacon at Cambrai, by Archbishop Ladislas Jonnart, 2 June, 1672. When not occupied with the duties of his canonry or with his theological studies, he was engaged in good works, under the guidance of his spiritual director. After four years, he was ordained deacon at Paris, 21 March, 1676, by Francois Batailler, Bishop of Bethlehem. On this occasion de la Salle sought to obtain the permission of Maurice Le Tellier, Archbishop of Reims, to resign his canonry and prepare for parish work. Nicolas Roland urged him to take this step, alleging that a rich canonry was little in harmony with youthful zeal and activity. His archbishop, however refused his request. 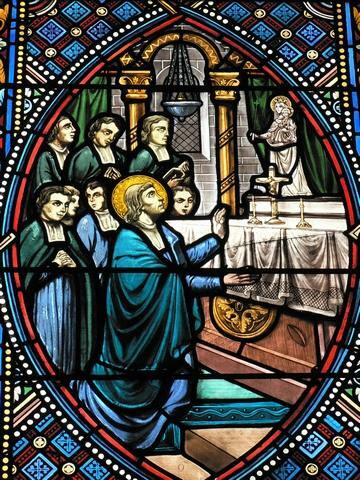 With humble submission, de la Salle accepted the decision and returned to Reims to pursue his studies and to make final preparations for his ordination to the priesthood. He was ordained priest by the Archbishop of Reims, on Holy Saturday, 9 April, 1678. The young priest was a model of piety, and his biographers say that persons went to assist at his Mass to be edified, and to share his piety. After Mass there were many who sought his counsel and put themselves under his spiritual guidance. De la Salle never omitted Holy Mass, save when prevented by sickness. In June, 1680, he submitted to his final examination and took his doctorate in theology. At this period of his life de la Salle evinced a docility of spirit, a self-diffidence, that bespoke the character of the man and saint. In physical appearance he was of commanding presence, somewhat above the medium height, and well-proportioned. He had large, penetrating blue eyes and a broad forehead. His portraits present a picture of sweetness and dignity, beaming with intelligence and breathing an air of modesty and refined grace. A smile plays about the finely chiseled lips and illumines a countenance to which the large lustrous eyes give an air of commanding intelligence. During the few years that intervened between his ordination to the priesthood and the establishing of the institute, de la Salle was occupied in carrying out the last will and testament of Nicolas Roland, who, when dying, had confided to him the newly established Congregation of the Sisters of the Child Jesus. “Your zeal will bring it to prosperity”, said Nicolas Roland to him. “You will complete the work which I have begun. In all this, Father Barre will be your model and guide.” Thus was de la Salle imperceptibly drawn towards his life-work. “The idea never occurred to me”, de la Salle wrote in a memoir. “If I had ever thought that what I did out of pure charity for the poor school teachers would make it incumbent upon me to live with them, I would have given it up at once.” This sentiment he again expressed towards the close of his life in these emphatic words: “If God had revealed to me the good that could be accomplished by this institute, and had likewise made known to me the trials and sufferings which would accompany it, my courage would have failed me, and I would never have undertaken it.” At this period de la Salle was still occupied with his functions as canon. He was, however, aroused to the higher calling by a message from Madame Maillefer, in March, 1679, requesting him to aid Adrien Nyel in opening a free school at Reims. But hardly had he succeeded in establishing the school of St-Maurice when he quietly withdrew from the work, as if it were not his mission. Shortly afterwards the opening of another free school in St-Jacques parish lured him again from his seclusion, but he soon retired again. 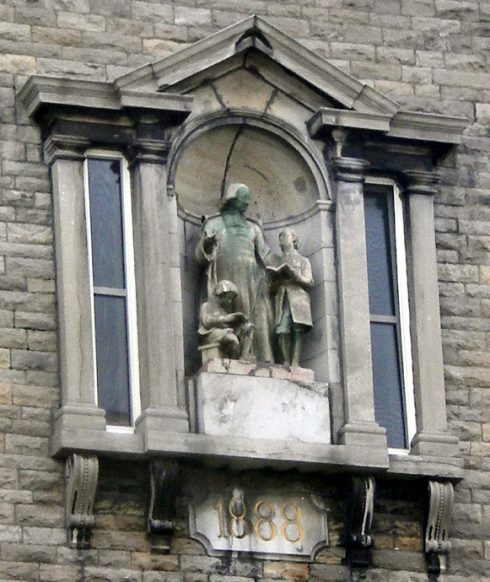 Statue of St. John Baptist de La Salle in Canada. Although instrumental in opening these elementary free schools at Reims, de la Salle seemed to allow Adrien Nyel to share all the honours resulting therefrom, while he was content to labour assiduously for the real progress of both schools. He was unconsciously attracted to the work. Daily he visited the teachers to encourage them or suggest practical methods to attain definite results. But when he found that the teachers became discouraged, owing to the lack of proper guidance after school hours, he undertook to house them, that he might be able to direct them and give them practical lessons in the useful employment of time, and to prevent weariness and disgust. Not only did he aid them in class and after class, but he made good any deficit in the cost of living. He even admitted them to his own table and later on sheltered them under his roof. Thus was he drawn closer and closer to them, forming an intimate fellowship with the teachers of the poor. “It was, indeed”, says Mgr. Guibert, “his love that induced de la Salle to devote himself to the young teachers of Reims. They were like abandoned sheep without a shepherd. 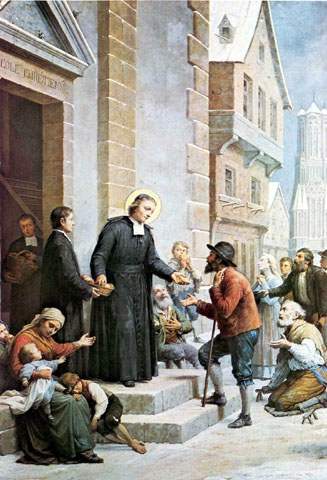 He assumed the responsibility of uniting them.” As yet de la Salle had no definitive plans for the future, even as late as 2 June, 1682, when he transferred his little community to the vicinity of rue Neuve. He simply kept himself in readiness to follow the guidance of Providence. He resigned his canonry in July, 1683, and he distributed his fortune to the poor in the winter of 1684, thus giving convincing proofs that he would not hesitate to make any sacrifices necessary to complete the good work he had begun. Pere Barre counselled de la Salle to give up whatever might divert his attention from procuring God’s glory. In reply to the earnest remonstrances of his friends and kinsfolk, he meekly answered: “I must do the work of God, and if the worst should come to pass, we shall have to beg alms.” Reliance upon Providence was henceforth to be the foundation of the Christian Schools. Up to this period (1684) the institute had lacked the characteristics of a permanent organization. From 1694 to 1717, the struggle for existence was most critical. In 1692 the institute was so weakened by deaths and defections that de la Salle could hardly find two Brothers who were willing to bind themselves by vow to maintain the free schools. The death of Henri L’Heureux in December, 1690, materially affected the rules of the Brothers of the Christian Schools. De la Salle, intending this gifted young Brother to be the future superior of the congregation, entertained the hope of having him ordained priest, and with this view he sent him to Paris to pursue his theological studies at the Sorbonne. After a brilliant course, Brother Henri L’Heureux was ready for ordination, but before this event took place the young candidate fell sick and died. The loss of this Brother was a blow to the founder. After passing the whole night in prayer, he rose up, not only comforted but strengthened, but also enlightened as to the character of his future institute. He then determined that there should be no priests among the members of his institute. Although there were priests and lay brothers in nearly all existing religious orders, de la Salle was convinced that the time had come for a change in this matter in the new congregation. Brother Lucard, the Annalist of the institute, thus sums up the matter: “Since the death of Henri L’Heureux, de la Salle was firmly convinced that his institute was to be founded on simplicity and humility. No Brother could, without compromising his congregation, allow himself to be diverted from his functions as a teacher, by devoting himself to special studies, the saying of the Divine Office, or the fulfillment of other duties obligatory on the sacred ministry.” Therefore, no Brother can aspire to the priesthood nor perform any priestly function, and no ecclesiastic can become a member of the institute. This is the new rule that de la Salle added, and it is embodied in the Constitution of the institute. From 1702 the founder began to endure a long period of trial, aggravated by persecution on the part of certain ecclesiastical authorities. In November, 1702, he was deposed by Cardinal de Noailles, and supplanted for a time by the Rev. B. Bricot. 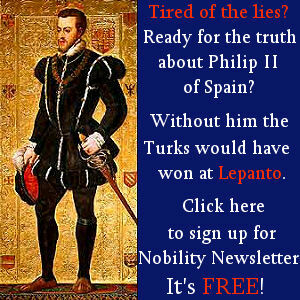 In 1703 one of his most trusted disciples, Nicolas Vuyart, treacherously deserted him. For the next ten years the holy founder was engaged in a series of struggles for the preservation of his institute, in the course of which his name was attacked, and justice denied him before the civil tribunals. After thirty-five years of hard labour, his work seemed to be almost on the verge of ruin. His confidence in God was so firm and unshaken that he was never really discouraged. 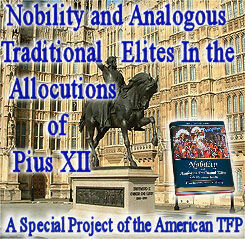 In 1711 he convoked a chapter for the purpose of solidifying the work and for the election of a superior general. His aim was to have a Brother elected during his lifetime and thus perfect the government of the institute in accordance with the rule he had formulated. 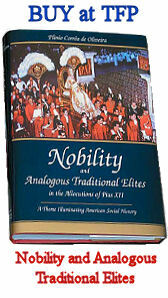 The choice of the assembled Brothers fell upon Brother Barthelemy, a man whom all esteemed for his learning and virtue. The institute was now an accomplished fact. And from the first interview with Adrien Nyel, in 1679, de la Salle belonged wholly to the Brothers, sharing with them the burden of labour and observing the common rule. He never left them to engage in other works. De la Salle was too prudent and too well inspired by God, not to give his institute a positive character in its twofold object: the Christian education of youth and the cultivation of that spirit of faith, piety, mortification, and obedience which should characterize its members. His gift of gaining souls to God, and of leading them to make great sacrifices, was supplemented by the splendid executive ability that enabled him to found an institute and to supervise and direct its gradual development. A study of the extraordinary religious, social, and educational conditions, at the time the institute was founded by de la Salle, will show the peculiar character of the difficulties he had to encounter and overcome. Jansenism had gained the ascendancy in France and broadcast its pernicious doctrines; it fostered internal dissensions and promoted Gallicanism, to the great detriment of the Faith and of loyalty to the Holy See. In the social order, a spirit of exaggerated independence was abroad, condemning authority or thrusting it aside. When such conditions prevailed in the upper classes, one may well ask, what must have been the condition of the masses? The incessant foreign and internal wars, with their consequent evils, told with disastrous effect upon the people. Exorbitant demands on the part of army officials, the violence of the soldiery, the rapine of supervisors, the wholesale plunder of crops, followed by famine and ruin, left whole provinces of France under the weight of terrible sufferings and untold misery. The peasants frequently had no bread, and when they had it the circumstances were such as to deprive them of any hope of sustenance for the morrow. Even when the gloom of internal turmoil had been momentarily brightened by the splendid victories abroad, the sad effect of the glory of the reign of Louis XIV made the mourning in cottages only the more bitter owing to the loss of the loved ones on foreign battlefields. Evidently, morals among the masses under these dire circumstances were threatened with ruin, as were the social and economic conditions; for false doctrines were spread and took hold among the people, destroying their faith and stultifying their consciences. Schools there were, but they were poorly attended and shamefully neglected. The children and the people generally were ignorant, and vice, according to contemporary authorities, was rampant among all classes. De la Salle carefully studied these conditions and, moved to compassion for the poor, resolved to improve their social and moral status. The founder grasped the situation and proposed as a remedy, popular free schools thoroughly graded and supplied with zealous teachers, who would implant in the hearts of the children the germs of those virtues that would tend towards the regeneration of both the pupils and the parents. He saw that a religious congregation composed of enlightened men, eager for the salvation of souls, could alone stem the tide of irreligion, vice, and ignorance. He clearly perceived that, in the peculiar conditions which surround any institute at the period of its origin, the work proposed to be done should embody in its ends the special requirements of the age in which it originates. He also foresaw that, while the guiding spirit of such an institute must ever remain fundamentally the same, its scope, as a permanent organization working for the welfare of humanity, should have the character of a social force answering to the needs and conditions of any age and country. Reading is one of he most efficacious means of acquiring knowledge. With due care in the selection of books, children who can read in the vernacular could spread the Christian doctrine in the family circle, and, on evenings, read some useful or instructive books to the assembled household; whereas, if they could read the Latin only, without understanding it, they would be deprived of many valuable benefits resulting from the intelligent reading of a good book. It is impossible for children in primary and elementary schools to master the reading of Latin texts, because they are not acquainted with its subject matter. It is, therefore, the part of wisdom to train children thoroughly to the intelligent reading of works written in the vernacular. Thus, having mastered the art of reading in the vernacular, a few months would suffice to make them read the Latin fluently, whereas, if the traditional method were followed, it would require at least several years [Annales de l’Institut, I (1883), pp. 140, 141]. Official portrait of St. John Baptist de La Salle, the Founder of the Brothers of the Christian Schools. It is by Pierre Leger and has been designated at the official portrait of him for the Congregation. 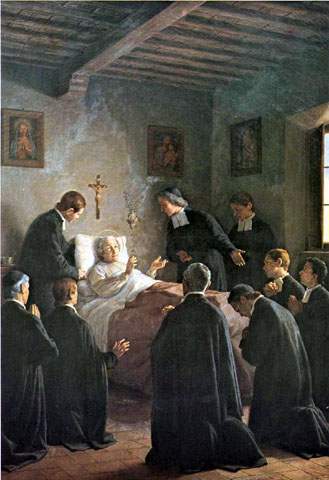 The death of St. John Baptist de La Salle. 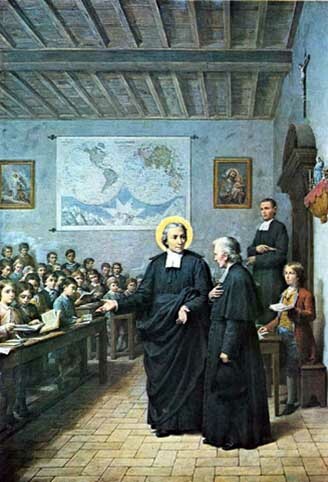 It is true that de la Salle, in establishing his institute, had in mind principally the primary and elementary school, which was the real raison d’etre for the existence of the Brothers of the Christian Schools. He was the organizer of the public instruction of his time, and no master of pedagogical science will deny him that distinction. But, if the primary and elementary school was the principal masterwork of de la Salle, there was yet another field of labour which likewise reveals his creative genius. At the opening of the eighteenth century, he was confronted with singularly perplexing conditions. The rising generation was weary of past glories, disgusted with the present and was ambitious to achieve renown in hitherto unexplored fields of activity. As education was gradually extending to the masses, with the light of instruction came new ideas, new occupations, new ventures, and a breaking away from the old civilization, with the desire to wrestle with the problems born of the new conditions. Even those who were trained in traditional methods became aware of a mighty change in men and things. They felt that there was a desideratum in the actual educational system. 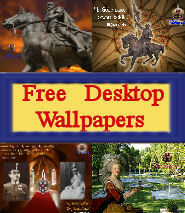 With their sons, they experienced the world-spirit breathing upon the moribund civilization of Louis XIV. The political horizon had changed, society became more degenerate, the intellectual world was awakened and cast off its lethargy, assuming a bolder attitude and aspiring to greater freedom in the realm of thought and research. De la Salle had been struck with the serious hiatus in the instruction reserved for the wealthy children, who were destined for the liberal professions. So, while organizing the primary and elementary school, he also created, in 1705, a special establishment until then unknown in the educational world. This new creation was the boarding college at Saint-Yon, wherein he inaugurated the system of modern secondary instruction. Saint-Yon became the type of all such colleges, and that of Passy, Paris, became the modern exemplar of similar institutions in France and elsewhere. M. Drury, in his report upon technical education, states that France is indebted to de la Salle for the practical installation and popularization of that form of instruction. Hence, from the origin of the institute, there was a constant adaptation of programmes to the needs created by the social transformations which were taking place. This flexibility, which contrasted with the fixedness of the university programmes, excited surprise and no little opposition among the representatives of academic authority in those days. The instruction given in the college founded by de la Salle and his successors was peculiarly adapted of the needs of a very interesting class of young men. The educational reforms thus planned and carried out by him give unmistakable evidence that Providence had raised him up to be the lawgiver of primary and elementary teaching, as well as the creator of a new system of intellectual training, combining the precision of the traditional method with the wider scope of the new one. It was but natural that de la Salle, who had assimilated the best that the seventeenth century could give, and who had become cognizant of the inefficiency of the old system to meet the requirements of the new conditions, should create schools which were then, and have been since, the admiration of educators. The boarding colleges founded by de la Salle for the modern secondary instruction are, therefore, a distinct creation. The date of the Saint-Yon college is 1705. He later added a technical school to develop the mechanical skill of the students, and also a special garden for botany. 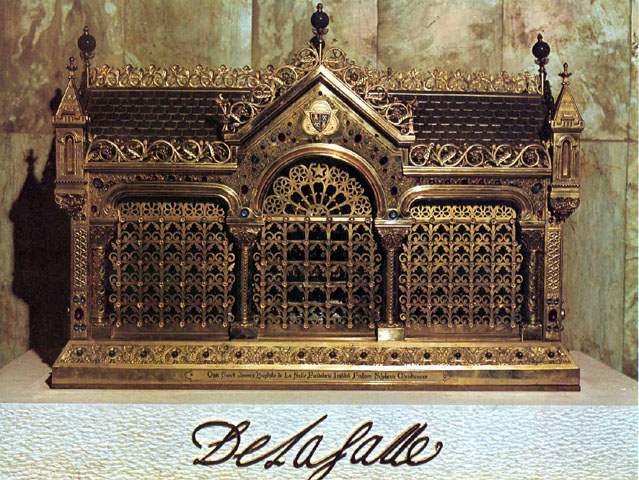 Relics of St. John Baptist de La Salle in the Casa Generaliza in Rome, Italy. 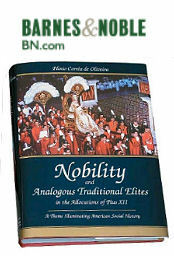 Alain claims that the first normal schools were the novitiates of the teaching orders. But there were no normal schools for lay teachers. De la Salle had been frequently asked by clergy to send a Brother to take charge of their school. This request was refused, for he had established the rule that not less than two Brothers teach in any school. Accordingly, he offered to open a seminary for teachers, an institution in which young men would be trained in the principles and practices of the new method of teaching. The normal school was opened at Reims in 1684. Indeed, thirteen years before Francke organized his teachers’ class at Halle, and fifty years before Hecker founded the Prussian normal college at Stettin, de la Salle had given a programme which is even today deemed excellent. In the same year he established for youths who were destined to enter the brotherhood, a Christian academy, or preparatory novitiate, in which they were taught the sciences, literature, and the principles of scientific pedagogy. This thought seemed to be uppermost in the mind and to haunt the soul of de la Salle, when he drew up those excellent programmes for his schools, colleges, and technical institutions. His pedagogic principle was that nothing human should be foreign to the students, and the teaching of science and letters appeared to him to take nothing from the teacher in his ministry as an apostle. In September, 1713, Clement XI issued the Bull “Unigenitus”, condemning the errors of Quesnel, culled from his “Moral Reflections”. M. de Montmartin, Bishop of Grenoble, promulgated the Bull in a circular letter, in February, 1714. De la Salle was then making a retreat at Parmenie. When he left this place, he entered the arena to defend the Church against Jansenism. He assembled the Brothers of Grenoble and explained the meaning of the Bull, in order to safeguard the purity of their faith. Not satisfied with this manifestation of loyalty, he published several articles in defence of the true doctrine. This irritated the Jansenists, but their opposition only served to give greater lustre to the purity of his faith and zeal. He was a fearless and uncompromising champion, and he seemed to forget his habitual calm and reserve when there was question of the integrity and purity of the Faith. To show his inviolable attachment to the Church and to the Sovereign Pontiff, he always signed himself Roman Priest. “Hold fast to what is of faith”, he writes to the Brothers; “shun novelties; follow the traditions of the Church; receive only what she receives; condemn what she condemns; approve what she approves, either by her Councils or by the Sovereign Pontiffs. In all things render her prompt obedience”. He was even eager to go to Rome to cast himself at the feet of the pope and request his blessing for the institute. However, not being able to go himself, he sent Brother Gabriel Drolin to establish a school there in 1700. Even the consolation of seeing his rule approved by the Holy See was denied the saint, for he had been dead nearly six years when, on 26 February, 1725, Benedict XIII, by his Bull, “In apostolicae dignitatis solio”, placed the seal of approbation upon the institute, empowering the members to teach and explain Christian doctrine, and constituting them a religious congregation. The last years of de la Salle were spent in close retirement at Saint-Yon. There he revised his rule before giving it to Brother Barthélemy, the first superior general. During the last days of his life he showed the same spirit of sacrifice which had marked his earlier years. In Holy Week of 1719, he gave unmistakable signs that the end was near. On Holy Thursday, at the request of Brother Barthelemy, he blessed the Brothers assembled at his bedside, and gave them his last words of counsel. His final words were: “In all things I adore the will of God in my regard.” On Good Friday morning, 7 April, 1719, he breathed his soul into the hands of his Creator. He was canonized by Leo XIII on 24 May 1900. His feast is celebrated on 15 May. The principal writings which he has bequeathed to his spiritual children are: “Conduite des écoles” (1717), a treatise on pedagogic method, presenting fundamental principles in a scientific manner. It is remarkable that the methods herein given have not been considerably changed since the time of its author, and that the principles laid down are as applicable today as when they were written. “Les Règles de la bienséance et de la civilité chrétiennes”, is a volume written in 1695, and used as a treatise on politeness and as a text in the reading of manuscripts. The style is simple and direct. It contains excellent rules for cultured manners. Les devoirs du chrétien” (73), a simple and precise exposition of Christian doctrine is remarkable for its accuracy, and for the practical lessons it inculcates. It was intended as a reader and a catechism. It still retains its place in many schools and colleges. “Recueil de différents petits traités à Pusage des Frères des Ecoles chrétiennes” (1711) is a noteworthy treatise, stating in remarkably simple terms the fundamental principles of the religious life. It abounds in Scriptural quotations and is a valuable guide for persons striving after perfection. “Explication de la méthode d’oraison” (1st printed ed., 1739). In point of clearness and adaptation, this method of mental prayer is eminently suited to the needs of the Brothers. It appeals to every degree of capacity, for all can find therein the spiritual food necessary for their special condition and state of perfection. “Méditations pour le temps de la Retraite” (1st printed ed. 1730), written for the exercises of the annual retreat, and, combining he principles of the spiritual life with pedagogics, tends to promote the Christian Apostolate in the school. These méditations contain some of the soundest principles of pedagogy ever enunciated. “Meditations pour tous les Dimanches de Panée, avec les Evangiles de tous les Dimanches; Meditations pour les principales fetes de Panee” (Rouen, 1710? ), is an epitome of spiritual doctrine, based upon the Gospels of the year and applied to the needs of the teaching profession and the principles of the religious life. This treatise reveals the greatness of de la Sale and shows him to be a man of deep religious conviction. His language is always simple, direct, and vigorous. BLAIN, Vie de M. Jean-Baptiste de la Salle (Rouen, 1733); CARRON, Une Vie (Paris, 1885); IDEM, L’Esprit et les Vertus du bienheureux J.-B. de la Salle (Paris, 1890); The Spirit and Virtues of Bl. J.-B. de la Salle (Tours, 1895); GARREAU, Vie de M. J.-B. de la Salle (Paris, 1875); CARRON, Le Tendre Ami des Enfants du Peuple (Lyons, 1828); L’Ami de l’Enfance (Lille, 1831); Le Veritable Ami de l’Enfance (Paris, 1838); DUROZIER, L’Abbe de la Salle (Paris, 1842); SALVAN, Vie de M. Ven de la Salle (Toulouse, 1852); AYMA, Vie de M. de la Salle (Aix, 1858); LUCARD, Vie du Ven. de la Salle (Paris, 1876); RAVELET, Vie du B. J.-B. de la Salle (Paris, 1888); GAVEAU, Vie de M. de la Salle (Paris, 1883); Life of M. de la Salle (Italian) (Rome, 1888); KREBS, Leben von J.-B. de la Salle (Ratisbon, 1859); GUIBERT, Histoire de Jean-Baptiste de la Salle (Paris, end ed., 1901); IDEM, Vie et Vertus de S. J.-B. de la Salle (Tours, 1901); DELAIRE, Saint Jean Baptiste de la Salle (4th ed., Paris, 1902); BAINVEL, Saint Jean Baptiste de la Salle (Paris, 1901); GUIBERT, Renouvellement religieux (Paris, 1903); IDEM, Doctrine spirituelle de Saint J.-B. de la Salle (Paris, 1900); BROTHER NOAH, Life and Work of the Ven. J.-B. de la Salle (New York, 1878); WILSON, The Christian Brothers, their Origin and their Work (London, 1883); DE DONCOURT, Remarques Historiques (Paris, 1773); FELLER, Dictionnaire Historique (Paris, 1797); CERF, Maison ou dut naitre le B. J.-B. de la Salle (Reims, 1870); CHEVALIER, Les Freres des ecoles chretiennes (Paris, 1887); RAVELET-O’MEARA, The Life of Bl. J.-B. de la Salle (Tours, 1888); BONVALLET, Sur la Noblesse de la Salle in La Revue de Champagne (December, 1888); PIN DE LA GUERIVIERE, Les aieuls maternels du Bienheureux J.-B. de la Salle (Reims, 1897); KNECHT, Leben von Johan Baptist de la Salle (Freiburg, 1879); SPEH., Der Heilige Johannes Baptista de la Salle und sine Stiftung (Kaufbeuren, 1907); HUBERT, Leben von Johan Baptist de la Salle (Mainz, 1887); LUCARD, Annales de l’Institut des Freres des Ecoles Chretiennes (Tours, 1883); CONSTANTIUS (M.M. GRAHAM) in Am. Cath. Review (July, 1900); IDEM, in Cath. World (August, 1900); BEDEL, La Vie du Rev. Pierre Fourier (Paris, 1666); ARNOLD, The Popular Education of France (London, 1861); SAINT-SIMON, Memoires (Paris, 1886); ALAIN, L’Instruction primaire avant la Revolution (Paris, 1881); ARNOLD, Notes et Documents sur les Etablissements d’Instruction Primaire de la Ville Reims (Reims, 1848); BABEAU, L’Instruction Primaire dans les campagnes avant 1789 (Paris, 1896); BUISSON, Dictionnaire de Pedagogie (Paris, 1887); RENDU, De l’Instruction Publique (Paris, 1819); BARNARD, De l’Enseignement elementaire en France (Paris, 1894); H. BARNARD, Normal Schools and other Institutions (Hartford); JUSTINUS, The Educational System of the Brothers of the Christian Schools in France; Report of the Commissioner of Education (Washington, 1898-1899).